Is it possible to use .desktop files to open local pdf files on specific pages with a browser? I realized that if I use this syntax for pdf files on the internet it works as expected and it opens the pdf on the page that I've predetermined, the problem is only with local files. 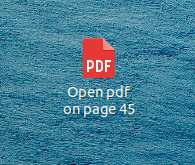 Is it possible to use desktop files to open local pdf files on specific pages? Or is it a limitation of desktop files? I need to look it up, but I seem to remember Type Link is deprecated in a .desktop file. Anyway, it won't work here as you found out. Encoding is deprecated for sure, but that isn't the issue. Furthermore, xdg-open won't work; it will open your default application for pdf files. Then make it executable and double-click. If you are using another browser, you need to change the Exec= -line to reflect that. Some document viewers allow you to start them with an argument pointing to the desired page. -i, --page-index=NUMBER     The page number of the document to display. Not the answer you're looking for? Browse other questions tagged pdf .desktop or ask your own question. How Do I Export Pages from Browser with Embedded Hyperlinks? How do I get Adobe Reader to print more than one page in 13.10 Saucy? How do I get Chromium browser to always ask where to save PDF files instead of automatically displaying it within the browser?